Reel Talk Online: Quick Question: Why Aren't You Watching SUPERSTORE? 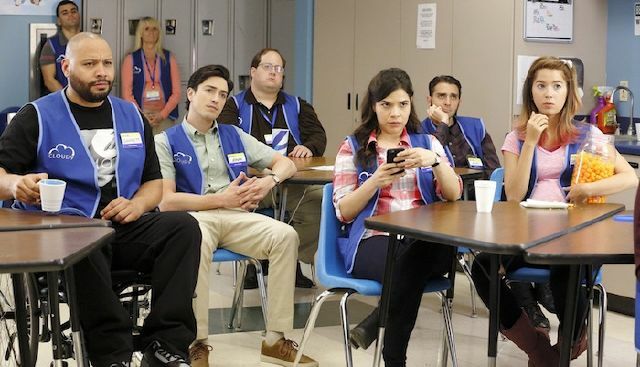 Quick Question: Why Aren't You Watching SUPERSTORE? It has been far too long since we've seen America Ferrera command the small screen like we all know she can. Six years, to be exact. Sure, she's hung out with Amy Schumer on the comedienne's hit sketch comedy show, and has had a number of TV stints--some of which I've never even heard of, listed on her IMDB page. But SUPERSTORE is seriously the best show you're not watching. It's fresh, smart and culturally relevant. If you're unfamiliar, Ferrera plays Amy, the assistant manager of a Wal-Martesque store where the customer is always right (no matter how batsh*t crazy they are) and chaos is always abound. In addition to her life as a mother and wife (most of which is played offscreen), she has to also come to work and be surrounded by a group of people ranging in levels of quirkiness--which makes for a great comedy. First of all, why has it taken this long for someone to come up with a workplace comedy series that is set in a superstore? I mean, that alone is brilliant. And with this wonderfully diverse group of characters, each three-dimensional with their own set of dyfunctions, it makes for a smart sitcom that's unafraid to approach topics such as gender discrimination, racial insensitivity, and adoption. Plus, your BFF Ben Feldman (you know, Michael Ginsberg from Mad Men) and Nichole Bloom (who played Amanda, Lip's gal pal on Shameless) are among the hilarious cast of clerks. Listen, I know there is, like, a sh*tload of great TV to watch right now, but you definitely need to make room for this in your viewing schedule. It's worth it. SUPERSTORE airs on NBC Mondays at 8pm. I always forget about TV comedies. If it's not Veep, I'm so bad at watching them. I might have to check this out. I never watched Ugly Betty religiously, but I remember the few episodes I did watch, I really loved Ferrera in it.